Mega Sale! 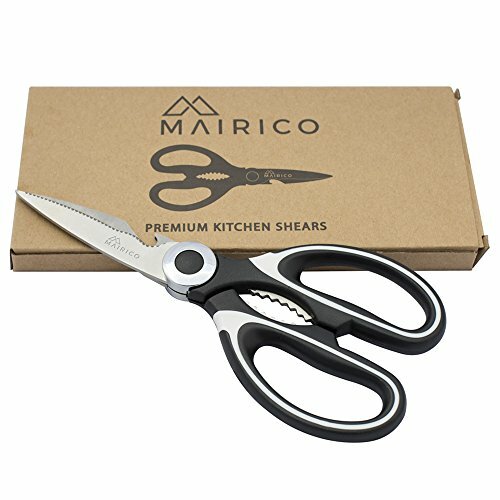 Save 27% on the MAIRICO Ultra Sharp Premium Heavy Duty Kitchen Shears and Multi Purpose Scissors by MAIRICO at PBD Trio. MPN: ATT-01. Hurry! Limited time offer. Offer valid only while supplies last. The best professional kitchen shears that deliver impeccable performance inside the kitchen as well as outside. It is also built to last . The best professional kitchen shears that deliver impeccable performance inside the kitchen as well as outside. It is also built to last . Professional, high quality, beautiful, impressive performance and is sharp, sharp, sharp here're some of what our customers are saying: "these here are probably the best as far as build quality goes" squats loves milo "beautifully finished and sharp" "they are super sharp" strong this is a super sharp pair of kitchen shears that will make your job inside the kitchen as well as outside much easier and much more enjoyable. Go ahead, add to your cart and give it a try. IMPECCABLE PERFORMANCE FOR KITCHEN TASKS: The blades are ultra sharp and deliver highly precise cuts with minimal effort. It performs extraordinarily well in all major kitchen tasks, such as butterflying poultry, cutting meat, chicken, poultry bones, vegetables, fish, various foods, herbs, etc. Its high quality blades and extreme sharpness made it a terrific performer in and outside the kitchen. Each cut is buttery smooth and unexpectedly enjoyable. REMARKABLE PERFORMANCE OUTSIDE THE KITCHEN: So sharp and so little efforts, you would want to use it everywhere and you can. You would want an extra pair for cutting cardboards, papers, hard plastic of product boxes, trimming rose stems, etc. MEANINGFUL ADDITIONAL FUNCTIONS: Opening bottles and cracking nuts are two common needs in the kitchen and are two functions included in this kitchen shears. Staying true to its mission of staying focused and performing well on available functions, the kitchen shears do not carry other features. PROFESSIONAL DESIGN, SUPERB QUALITY: Professional design and ultra sharp blades make it feel comfortable, light and effortless while easily outperforming all other shears. It is made from premium, durable, top grade stainless steel that is rust and corrosion resistance. Its handles are designed to provide comfortable, firm, non-slippery contact. It is dishwasher safe, although hand wash is recommended. TOP PERFORMANCE GUARANTEE: We're confident you'll find the shears amazing, delivering enjoyable, buttery smooth feel to each cut of meat, skin or fat. But you're not happy for whatever reason, simply return it for a FULL REFUND. If you have any questions about this product by MAIRICO, contact us by completing and submitting the form below. If you are looking for a specif part number, please include it with your message.